There was a major occasion in Parliament House last month (24th May 2011) that went unreported in the mainstream media (MSM), but which may be of interest to the Australian public. Our Prime Minister, Julia Gillard and 7 ALP MPs together, with the Leader of the Opposition, Tony Abbott and 8 Lib/Nat MPs, were in attendance. Israel’s Ambassador to Australia, Yuval Rotem, was present, but the Greens were either uninvited or declined to attend. The very rich, pro-Israel lobbyist, ALP benefactor and former employer of our PM’s partner (1, 2, 3, 4), Mr Albert Dadon, presented our Australian Prime Minister ‘with a portfolio of recommendations to enhance the relationship between Australia and Israel’ (5, 6). This included improving trade and “security” links. It is interesting that this was on the first anniversary, almost to the day, of Australia’s expulsion of the Canberra-based Mossad [Israel’s spy network] chief, after Mossad had forged 4 Australian passports last year. Has the portfolio included an apology, rather than denials, to the Australian public for treating them with contempt (7)? Could the portfolio include an agreement for extra biometric markers for dual Israeli/Australian passport holders? Or do we just get more hollow reassurances from Israel that it won’t do it again? Is one of the recommendations, to re-establish a Canberra-based Mossad chief? Are BDS activists, such as the brave people of Marrickville, to be targeted by the proposed “security” collaboration? But our MSM seem to have chosen to ignore this event altogether and not ask the tough questions, but you can read about it in the Australian Jewish media (6, 7). I wonder why? 1. 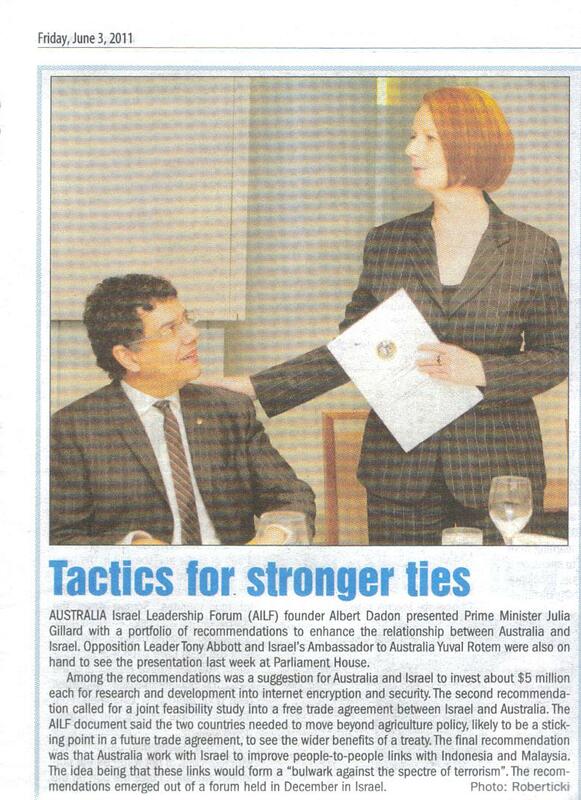 The Age, 29/6/2010, ‘Gillard accused of soft line on Tel Aviv’ by Dan Oakes and Dylan Welch ( http://newsstore.smh.com.au/apps/viewDocument.ac;jsessionid=BEA330DFCFAB72E402BC81ED9F3FDA90?sy=afr&pb=all_ffx&dt=selectRange&dr=1month&so=relevance&sf=text&sf=headline&rc=10&rm=200&sp=brs&cls=476&clsPage=1&docID=AGE100629RH30H3965EG ). 2. Heretic Press website, ‘Australian Democracy on the Israel Lobby’s Leash’ for scanned copies of article and photograph, ‘The PM, her partner and the pro-Israel lobbyist’ ( http://www.hereticpress.com/Dogstar/Religion/Faith.html ).